This review has not yet been approved by the owner of this writing service. If you are the webmaster of Write-right.net, please Contact Us to approve or remove this review. RevisionLabs (currently Write-Right) produces a very favorable impression. Pleasant yet not overloaded design, convenient arrangement of information and functions, easy-to-use order form, detailed, almost excessive data on every conceivable feature of the service – it is exactly how such a site should be. 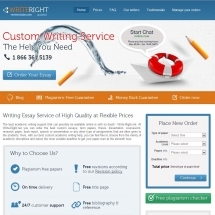 This service positions itself as the cheapest writing agency on the Internet. It is not exactly true, but the lowest prices are really pretty affordable – essays start at mere $8.95/page (lower than most agencies offer). However, as the urgency and academic level increase, the price skyrockets – up to $82.95. In other words, the company offers a wide range of prices that will suit anyone, no matter what kind of assignment they need. The price is based on academic level, urgency and type of assignment. Additional features demand additional fees, naturally. The site misleads its client. Most pages boast of 24/7 support, however, the “Start Chat” button clearly states that both chat and phone support are only available on workdays. Phone is toll-free only for US, UK and Canada residents. If you are not one and it is weekend – it’s your bad luck. When the chat is online, however, the operators are helpful, polite and well-informed. The text was delivered on time, and expertly done in full accordance with my instructions. It’s really hard to say much more, for usually you go on about negative impressions, which is not the case here. An excellent writing service with only two drawbacks: rather steep pricing curve and support team that doesn’t work on weekends. Very open about their work – I have yet to see another service that posts realistically-looking satisfaction percentage of their clients. Recommended, especially for UK, US and Canadian residents, who don’t have to worry about customer support.